One of the enigmas was Jan Franz, participant no. 24 in the second phase of mitochondrial testing, who later took autosomal updates with the company’s Cherokee DNA Test, a version of the DNA Fingerprint Test that searched for three Cherokee populations and some fifty American Indian groups in all. Born in Florida and originally adopted, Franz did not meet her birth parents until she was in her thirties. Her birth mother was the first to tell the young woman about her Cherokee heritage as well as her Scots-Irish and other ancestry. “I knew before that,” says Franz. “There’s no explaining it, I just knew.” Bagpipe music always gave her goose bumps. In her teens growing up in rural Virginia, her classmates called her “half breed.” She wore feather earrings and dyed her auburn hair black. 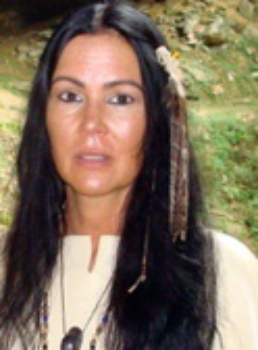 In 2008, she married Chuck Franz, another part Cherokee, in a historical tribal bonding ceremony at Yahoo Falls, Kentucky. They both became active members of the Piqua Shawnee Tribe, which accepts admixed natives of all backgrounds. In the years since then, the litigation paralegal and artist built a family tree that went back to the 1600s. She verified historical figures that were said to have intermarried with the Cherokee—Saunders, Sizemore and Green—and traced a number of Melungeon connections as well as Mennonite and Pennsylvania Dutch. One line on her mother’s side snaked back to Jonathan Greenblanket Green, a Seneca chief who signed the Buffalo Creek Treaty of 1788. Chief Green was married to Betsey Jemison, whose mother was Mary Jemison of “captivity narrative” fame in American colonial history. Mother: Gail Annette Greene (b. 1940) Fla.
Grandmother: Lucile Aurora Futch (1914-2002) Fla.
Great-grandmother: Daisy McArthur (1896-1998) Fla.
Great-great-grandmother: Martha L. (Lulu) Green (b. 1879) S.C.
3rd-great-grandmother: Louisa Wade (1861-1920) S.C.
4th-great-grandmother: Mary Way (b. 1839 d. May 30, 1920, race: black/non-white, occupation: midwife) S.C.
5th-great-grandmother: Elizabeth Way (maiden name unknown, b. 1822) S.C.
After Elizabeth, the line disappears, and as blacks were not named in pre-Civil War records, seems untraceable. Elizabeth’s husband may have been Joseph Way, born about 1808, in South Carolina. The rest of Franz’s tree is strongly centered on Georgia and central Georgia in former Creek territory, now known to be of pervasive Apalache, Yamasee and Apalachicola culture. There was a possibly of Cherokee connections with her Sa(u)nders families in Georgia. Otherwise, no definite Cherokee ancestor could be identified. After the company added Cherokee and other Native American population data in 2015, Franz retested her ancestry. In the meantime, she had begun to suspect that she had significant Middle Eastern ancestry in addition to Native American. Her mother’s mother was named Lucille Aurora Futch (a corruption of Fuchs) and had jet-black hair. To everyone’s surprise, Franz’s top ethnic result on an autosomal basis was Armenian. In her megapopulation analysis, Armenian was no. 1, with a strength factor of 108, while Middle Eastern was no. 2, with a strength of 104. The term Armenian came from from over a hundred Armenians sampled in four different places with Armenian parents and grandparents in three countries whose DNA was studied in 2011. [ii] These top two results were much more prominent than American Indian, the no. 3 result, and 10 times stronger than the lower tier mega-populations in her makeup. One of the four Armenian populations, Gardman, Azerbaijan, was also reported as a leading result in her country population matches (no. 6), just below Afghan, Turkish and Cherokee. Both Turkey and Armenia, as well as Israeli Jews, are considered European populations for the purposes of DNA comparisons. In this section of her report Franz got Armenian as her no. 3 hit. Armenian came after Northern Ireland and the Netherlands, both countries well adduced in her genealogy. Armenia was followed by England/Wales, France, Scotland, Italy and Portugal, nationalities also strongly represented in her family tree, as confirmed by surname origins (list about 10 that are English etc.). Franz told the author that she was not aware of any Armenian connections in her family tree. No other company’s DNA tests had pointed to Armenia. About the same time as this mystery was unfolding, a man in Canada contacted customer service with a question about his results. Why was his no. 1 world match Cherokee? He told us all four grandparents were Armenian, born in Armenia of Armenian ancestry all the way back. No one ever suspected any Native American DNA. Was it a mistake? Generally speaking, Armenians carry genetic traces of both the ancient peoples whose descendants make up the current population (Armens, Colchians, Hattians, Hayasa, Hayk, Hittites, Hurrians, Kaskians, Luwians, Mitanni, Mushkis, Pala, Phrygians, Urartians, etc.) and the ancient invaders who conquered or passed through the Armenian lands (Assyrians, Gamrik-Gimirri-Cimmerians, Galatian Celts, Greeks, Parthians, Romans, Scythians, Macedonians, Medes, Persians, Mongols). The Armenian Genocide of 1915 was the culmination of an official policy of eradication pursued over centuries. In the short span of a few years, Turkish authorities killed millions of Armenians, leaving only 400,000 out of an estimated 2 million present on the eve of World War I. The pitiless mass executions caused an explosion of refugees fleeing Turkey. The largest Armenian diaspora settlements today are located in Russia, the United States, France, Georgia, Lebanon, Iran, Germany, Syria, Ukraine, Turkey, Azerbaijan, and Brazil. There are around 5 million people with full or partial Armenian ancestry situated outside of Armenia. This is more than the number of Armenians who live in their old homeland, split between the Republic of Armenia (formerly part of the USSR), Turkey to the west, Georgia to the north, the de facto independent Republic of Artsakh and Azerbaijan to the east, and Iran and Azerbaijan’s exclave of Nakhchivan to the south. Armenians are united by a common language, religion (a form of Christianity similar to Greek Orthodox) and distinct culture. Their language belongs to the Indo-European family, where it constitutes a one-language linguistic group. Experts in the past classified it with Persian, but its separate status and autonomy are now recognized. It was one of the earliest languages in the region to be written and enjoys its own distinctive alphabet with a long-flourishing literature and traditionally high literacy rate. The Armenian Church has a venerable history. It originated in the missions of Apostles Bartholomew and Thaddeus in the first century, according to tradition. Armenia was in contact with Rome but had the good fortune to lie outside its frontiers. Partly for this reason, it looked for religious authority within and was separate doctrinally from both the Orthodox Byzantine Empire and Nestorian Christianity, the sect that spread along the trade routes between Rome and China. With the rise of Islam in the Middle East, Armenia became a Christian island in a Muslim sea. Curtin believes that the Armenians’ isolation as a separate religious community underlined the need to deal tactfully with their Muslim neighbors. Such a position probably spelled their commercial success as long-distance traders through Muslim lands. Strategically placed, Armenia acted as a crossroads for trade passing from China and India to Europe and the Near East along the famous Silk Road and other routes. The phenomenal success of Armenian merchants was spread over three periods in the ancient past. In the sixth through the ninth centuries BCE, the Armenian kingdom of Urartu enjoyed great prominence. As Rome rose to power in the second century BCE, the Armenian empire controlled all overland trade to and from China, belonging to the Parthian bloc rather than Roman orbit. And finally, in the tenth century CE, Armenia became again prosperous and powerful, its reach extending even to the Mediterranean. Not until it was conquered by the Seljuk Turks in 1070 did Armenia decline. Later, Armenians were confined to a small conquered area and not allowed to visit their former extended lands. At the end of the barbaric Turco-Mongol invasions of the fourteenth century, Armenia was partitioned between the Ottoman Turks and Safavid Persia. Such a conjoining of peoples squeezed out of Khazaria, together with Armenians driven eastward into Central Europe, may explain the genetic confusion of Ashkenazi Jews and Armenians first suggested by Eran Elhaik. [vi] Could Cherokees be mistaken for Armenians (and vice versa) because Cherokees included a lot of Jewish DNA? In 1620, there were no fewer than forty Armenian trade houses in Amsterdam alone. New Julfa ships flying the red-yellow-red flag with the Lamb of God ensign sailed all over the world. Commercial republics including Courland and Ragusa were governed by Armenian merchants, often acting in concert with Jews. Did Armenian merchants reach the American frontier and trade with and intermarry with Indians like the Jews? Richard Thornton is today a respected architect, author and museum exhibit designer specializing in Southeastern Indians. He lives in a house on the eastern end of the Nacoochee Valley near a Creek sacred site called the Alec Mountain Stone Circle. But it was not always so. On the morning of December 24, 2009, as the Great Recession kicked into high gear, two deputies showed up unexpectedly at his mountain home with an eviction notice that said he had to vacate the premises by 6:00 p.m. that day, Christmas Eve. He showed them a letter from Fannie Mae, dated December 12, 2009, which set the closing date for a mitigation loan on January 12, 2010. It was not their concern, they said. He left in a panic, abandoning most of his food, gear, appliances, books, drafting equipment and other possessions. As a young man, Thornton served in the Navy, traveled to, among other destinations, Sweden, studied at Georgia Tech, went on a fellowship to Mexico, and lectured around the Southeast on Mesoamerican architecture, without knowing very much at all about his own Creek heritage. Then, three Christmases after his eviction, History Channel’s H2 network premiered a new series entitled “America Unearthed,” the opening episode entitled “American Mayan Secrets,” based on Thornton’s exotic theories and out-back rambles around Georgia. It became the highest rated show ever for History Channel’s H2 network. Uchee (also called Euchee and Yuchi), whose origins he has traced to the Saami of South Sweden in the Bronze Age. Paracus, Satipo, Conibo, Shipibo, Cashibo, Ashinanka, Chiska, Tupi, Panoan, Southern Arawak (South America). Maya, Totonac, Huastec, Tamaule, Tamale, Zoque, Pima, Chontales de Oaxaca, Tolteca (Mesoamerica). Taino, Arawak . . . All indigenous peoples of Cuba, Hispaniola, Puerto Rico, Virgin Islands. Although he is interested in the original People of One Fire or Creek Confederacy, that is, the Alabama (Alibaamu), Chickasaw, Kashe-te (Upper Creeks), and Apike/Abeika (Upper Creeks), he reserves his greatest admiration for the Kingdom of Apalache, the namesake of the Appalachian Mountains, a confederacy that flourished until the early eighteenth century. Tribes in alliance with the Maya-style kings of North Georgia include, for him, the Apalachicola, Palachicola, Florida Apalachee, Coweta, Cusseta, Ogeechee, Cusabo, Itsate (Hitchiti), Koasate, Oconee, Okate, Tamatli, Tamahiti, Tamali, Toasi, Toasee, Chiaha, Taskeke (Tuskegee), Tuskete and Talasee. In 1717, as Thornton likes to remind those who think Georgia had only Cherokees and Creeks, the Creek Confederacy included the following groups: Tocasee, Tuckabatchee, Culasee, Cullawhee, Oakfuskee, Eufaula, Ilape, Pee Dee, Hillabee, Talwaposa, Tallapoosa, Etalwa, Shawnee, Savano, Xuale, Suwanee, Sawakee, Sawate (Sautee), Sawakli, Atasee, Chattahoochee, Pakanahuere (Peachtree), Echete, Yamacraw, Okamule-ke, Okmulgee, Westo, Bohuron, Thamacoggin (Tamakoa), Keowee, Thloplocco, Conchakee, Hontaoasee, Hontawekee, Anawakee (who gave their name to what became Trenton, Ga.), Kataapa (Catawba), Satipo and Santee. 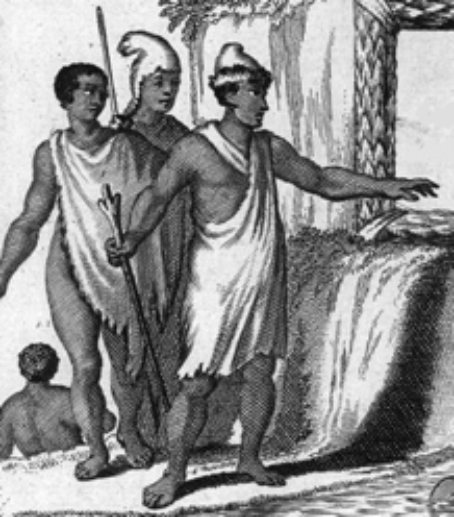 Apalache Indians from a 1673 map. The English in Virginia depicted the first native peoples they encountered in the American Southeast as dark-skinned, muscular and statuesque with European features and curly hair. They were dressed in flowing garments and wore a hat with a pointed crown that curled forward. This was the Phrygian cap, a type of headdress worn not only by Phrygians but by all inhabitants of Anatolia and of nations farther east according to the ancient Greeks. It was later adopted by Creek leaders. Public domain. The band played on. Thornton was harassed and threatened by trolls from the Cherokee Nation Office of Recognition, academicians with a vested interest in Cherokee history and know-nothing racists. He was also lauded and encouraged by those who took more open-minded positions. Some of the refugees came to North America, Thornton argues. Most of the galley slaves in the Turkish navy were Christians from conquered lands such as Austria, Hungary, Bosnia and Croatia. During almost continuous warfare along religious lines, a mixture of Protestant Christians, Eastern Christians, Jews and Muslim prisoners were taken on as galley slaves by Spanish ships whenever the Catholic Hapsburgs won a battle against the Ottomans, Dutch or English. A key witness to Thorndike’s version of the commingling of tribes and possible early presence of Armenians is a journey into the interior undertaken by the Virginians James Needham and Gabriel Arthur in 1673. They are described in a letter from Abraham Wood to John Richards, dated August 22, 1674. A mysterious church with a giant bell was reported in the interior, along with men with long beards. Thorndike thought the description “seemed to be a Georgian or Armenian Orthodox Church.” But where exactly did James Needham travel to see such a sight in 1673? Although the brick church, bell and hairy men have traditionally been located on the Tennessee River in Tennessee and presented as evidence that the Cherokee were situated upstream from these “white folk” in the seventeenth century, a consensus now inclines toward placing the theatre of the Virginians’ first interactions with the Indians of the Appalachians not along with Watauga River where the Cherokee were believed to have lived but in a surprisingly different direction. The true facts emerge from close scrutiny of this important historical document. [iii] In the interests of developing the deer and beaver fur trade, Abraham Wood sent James Needham and Gabriel Arthur, an indentured servant, with eight Indians and four horses westward from Ft. Henry (present-date Petersburg, Virginia) to explore uncharted lands. Wood was responsible for three of the most important explorations of the Appalachian Mountains in the seventeenth century. He went on his own trip with Edward Bland in 1650, he mounted the Batts and Fallam expedition of 1671, and he dispatched Needham and Arthur in 1673. For many years, the New River was known as Wood’s River. They go due west toward the mountains and in four days reach a divide which takes them abruptly from the Atlantic watershed to the Gulf watershed. “Ye ridge upon ye top is not above two hundred paces over; ye decent better then on this side.” This was probably a point in the Eastern Continental divide similar to the famous gap near Highlands on the way to Keowee in South Carolina, on the present boundary between Georgia and North Carolina. It could have been Cowee Gap (elevation 4,199 ft.), a mountain pass on the Eastern Continental Divide between Highlands and Cashiers in the far southern part of western North Carolina. Cowee Gap forms the watershed between the Cullasaja River and Chattooga River basins, which belong in turn to the much larger Tennessee and Savannah basins to the west and east, respectively. The Cullasaja River tumbles down the mountains from a spring near Highlands and joins the Little Tennessee near Franklin. Now, at any rate, the voyagers were in French territory, not English. The French Broad River, rather far to the north of them, was so named for the same reasons. At this time, however, neither the French nor the Cherokees were in evidence. The travelers reported that the area was wild and trackless. In half a day, they came to level ground in a valley after continuing west. “The water runs to the northwest.” They were now on the other side of the divide. They continue west several days, with “straggly” hills to the north, and cross five fordable, shallow, “pebbly” rivers that run to the northwest. This perfectly describes north Georgia topography. The rivers appear to be the Hiwasee, Nottely, Ocoee and their branches. It was a tough terrain. “By this time they have lost all their horses but one; not so much by the badness of the way but by hard travel, not having time to feed.” The most important aspect of this stretch of their journey is the absence of inhabitants. There is no path until they come within two days of the Tomahitans. It is fair to conclude that this part of North Georgia, later the heart of the Gold Belt, was depopulated. It certainly did not belong to the Cherokees, as was later claimed in official histories. At ye end of fifteen days from Sitteree they arrive at ye Tomahitans river, being ye 6th river from ye mountains. This river att ye tomahitans town seems to run more westerly than ye other five. This river they past in cannoos ye town being seated in ye other side about foure hundred paces broad above ye town, within sight, yet horse they had left waded only a small channel swam, as they were very kindly entertained by them, even to adoration in their cerrimonies of courtesies and a stake was sett up in ye middle of ye towne to fasten ye horse to, and aboundance of corne and all manner of pulse with fish, flesh and feares oyle for ye horse to feed upon a scaffold sett up before day for my two men and Appomattocke Indian that theire people might stand and gaze at them and not offend them by theire throng. All official Cherokee and federal Indian information puts Tomahitan Town in the Tennessee River drainage and equates the Tomahitans with the Overhill Cherokees. It is a central tenet of Southeastern Indian history. But this interpretation is plainly mistaken. The Alabama River unites with the Tombigbee, forming the Mobile and Tensaw rivers, which discharge into Mobile Bay. This was a corridor of mixed cultural influences, which gave birth to Mobilian trade jargon. It was roamed, south to north, by the Tihanama Indians, who ranged from Fort Walton, Florida to the Great Lakes, making Tennessee a favorite stopping place. Eight dayes jorny down this river lives a white people which have long beardes and whiskers and weares clothing, and on some of ye other rivers lives a hairy people…. …that ye white people have a bell which is six foot over which they ring morning and evening and att that time a great number of peple congregate together and talks he knowes not what. They have many blacks among them, oysters and many other shell-fish, many swine and cattle. Theire building is brick, the Tomahittans have a mongest them many brass potts and kittles from three gallons to thirty. They have two mullato woman all ye white and black people they take they put to death . . . .
Who were these whiskered white people with brick buildings and a large bell and black people among them? How far down the Alabama River were they? Oysters cannot survive in freshwater, and if the reference is correct, not a mistake for a fresh water cousin resembling oysters, the mysterious interlopers must have been close to Mobile Bay, the site a quarter of a century later of the French colonization efforts centered on the middle Gulf Coast. But on the other hand, is Mobile Bay only eight days downriver from Rome, Ga. by canoe? But there is a lot more to consider. Wood’s report was filed a year after the expedition set forth, and “my people returned affecting little.” The rest of the letter describes Gabriel Arthur’s treacherous murder and the captivity of James Needham, who was forced to participate in the Tomahitans’ wide ranging rampages. It becomes clear that these “traders” were also robbers, slavers and murderers who ranged up and down a lawless swathe in the interior. This zone extended from the middle Gulf Coast to Port Royal in the Carolinas and northward into the Kanawa River valley and what is now West Virginia. It was not an ideal country for establishing trade relations with the Indians, as Wood confessed up front (see App. C.). The Indians of the Appalachian Southern Highlands and the river basins that led down to the Gulf and Atlantic coasts, according to Thornton, were inhabited by a welter of peaceable tribes, warlike kingdoms and mixed bands of lawless renegades. Their names, mostly recorded through the French, include: Tamahitan, Weesock, Moneton, Koasati, Kaskinampo (“Many Warriors” in Koasati), Shipikesippi (Panoan), Chiska (Panoan, a South American group, coincidentally the name of the Cherokee Bird Clan), Talikoa, Cataloochee, Mosopeleacipi alias Olighin (Allegan), Chaskepe, Agoa, Ossachil, Coweta, Kaushite (Koasati), Chickasaw, Apike/Abikas, Apalache/Apalachee (Itsa Maya), Apalachicola, Chawowanous (Shawnee), Caouitas, Couih, Taogana, Tionontatecaga, Esaw, Wateree, Conchatez, Katapas (Catawbas), Taskogan, Talabouchi (Tallapoosa), Têtes Plates (Flatheads, Choctaw), Mobilians, Tapa, Natchez, Paducahs, Pani or Paniases, Natchitoches, Washas, Yamasee, Altamaha, Chitimachas, Taensas, Yuchees, Biloxi, Chatos, Naniabas, Towasas, Tomes, Pensacolas, Pascagoulas, Alabama, Cheraqui and Chalaka. Of this long, but by no means exhaustive list, only the last two names designate tribes who could possibly be Cherokee people. Tchalaka is a Shawnee word meaning the “people over there” and is apparently an adaptation of the Cherokee tribal name Tsalagi, as is also Cheraqui. Tchalaka is named on the 1684 Jean Baptist de Franquelin map of North America and placed in a location on the Little Tennessee River, upstream from the later site of the English Ft. Loudon near Knoxville, Tenn. Cheraqui appears as a town on the headwaters of the Savannah River on the 1717 De L’Isle map. Such are the tenuous traces of the Cherokee People in a vast sea of other Indians consisting of Apalache, Algonquian, Creek, Yuchi, roving bands of Caribbean Indians and other surprising ethnic groups. Somewhere in the same mix are Arabs, Moors, Armenians, Jews and Croats—ghost populations which do not survive as the same individual cultures in the same places today. After 1800, there was room in the white man’s version of history only for Cherokee, Creek and a few other tribes. “Don’t you wish you had a time machine and could go back and see for yourself who they were?” asks Thornton. The answer to this question is: We do. It’s called DNA. The next chapter will put us firmly in the driver’s seat of this time machine. [i] “Cherokee Tribe,” Access Genealogy: https://www.accessgenealogy.com/native/cherokee-tribe.htm. [ii] Richard Thornton, “From Armenia with Love, the Cherokee Connection,” People of One Fire: https://peopleofonefire.com/from_armenia_with_love.html. [iii] See Appendix A, “Needham and Arthur Expedition” for the original text. [iv] David G. Moore, Catawba Valley Mississippian: Ceramics, Chronology, and Catawba Indians (U of Alabama P, 2002) 31-34. [v] James Adair, History of the American Indians, ed. Samuel Cole Williams (Johnson City: Watauga, 1930) 242-43. This place was named for Maj. John Herbert who made a map of “Cherokee Country” in 1715 after accompanying Col. George Chicken on an expedition into the Tennessee country. [vi] Robbie Franklyn Ethridge, From Chicasa to Chickasaw: The European Invasion (Chapel Hill: U of North Carolina P, 2010) 86. Cf. Gregory A. Waselkov, and Bonnie L. Gums, Plantation Archaeology at Rivière aux Chiens, ca. 1725-1848. Archaeological Monographs 7 (Mobile: University of South Alabama, 2000). [vii] “The Secret History of Northeast Alabama”: https://peopleofonefire.com/the-secret-history-of-northeast-alabama.html.